The draft started with Penn State teammates Courtney Brown and LaVar Arrington being selected consecutively, making them the only Penn State players to go number one and two in the same draft. The New York Jets had four first-round draft picks, the most by any team in the history of the draft (17 teams have had three picks but no other has had four). The draft was notable for the selection of Michigan quarterback Tom Brady at the 199th pick in the sixth round by the New England Patriots; Brady has gone on to win 3 NFL MVP awards, a record 6 Super Bowl titles and 4 Super Bowl MVPs. 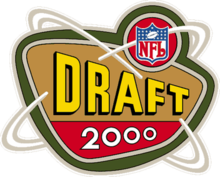 It was also the first year since 1966 that a pure placekicker was drafted in the first round, with the Oakland Raiders selecting Florida State's Sebastian Janikowski 17th overall. The University of Tennessee lead all colleges with nine selections in the 2000 NFL draft. ^ Maske, Mark (April 18, 1999). "Redskins Wheel, Deal, Draft a Champ". The Washington Post. ^ a b "Major move. Niners to give third pick to Skins for 12th, 24th selections". CNN/SI. February 27, 2000. ^ "The Fifth Element". CNN/SI. April 14, 2000. ^ a b "The Fifth Element". CNN/SI. April 14, 2000. ^ Battista, Judy (April 14, 2000). "Washington Redskins acquire No. 2 overall pick from St. Louis Rams". The New York Times. ^ "Panthers Acquire Sean Gilbert". Associated Press. April 21, 1998. ^ Elliott, Josh (April 24, 2000). "Washington Redskins acquire No. 2 overall pick from St. Louis Rams". Sports Illustrated. ^ "2000 NFL Draft Pick Transactions". Pro Sports Transactions. ^ "Joey on the Move". CNN/SI. February 13, 2000. ^ "Draft Day Trades". CNN/SI. April 16, 2000. ^ "Jets' best draft class featured a record four first-round picks". ESPN.com. April 25, 2016. Retrieved March 12, 2019.